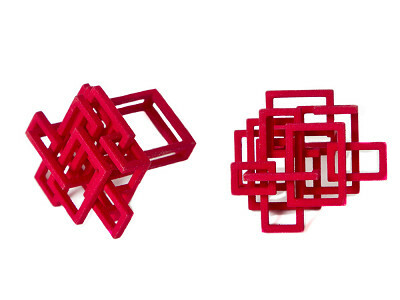 Simple squares are the building blocks of Melissa Borrell’s Open Square jewelry series, but there’s nothing elementary about her sculptural designs. The overlapping squares create layers of structure, like city architecture. Even the negative spaces become part of her intricate compositions. Melissa, who earned her master’s degree in jewelry design from RISD, uses advanced technologies to engineer her creations. Each necklace, ring and earring design is digitized using CAD software and fabricated with a cutting-edge 3D printer. The designs are intricate, yet despite the many layers of interconnected squares, the pieces are surprisingly lightweight. They’re made from a durable nylon material and finished with handmade metal accents. 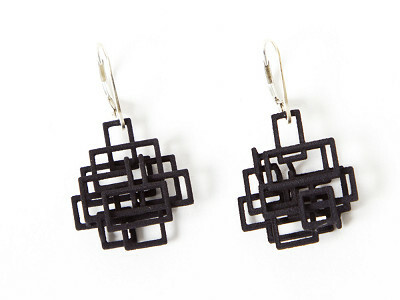 Modern and graphic, Melissa’s Open Square jewelry series makes a bold statement. It’s hip to be square. Hi Everyone! I'm so excited that The Grommet is featuring my 3D Printed Jewelry. I created all of these pieces virtually on the computer and then they were output in the final 3-dimensional format via a 3D Printer that builds the shape up layer by layer. These architecturally inspired pieces will spark interesting conversations when you wear them and tell people about this modern process. I find it really exciting to work in this new way. There are so many possibilities with 3D Printing and we are just at the beginning. I look forward to seeing what the future holds!